Borneo Bears footballers Timbal and Noor will train with the red and whites in the 2015-16 NTFL pre-season after starring in an international match. 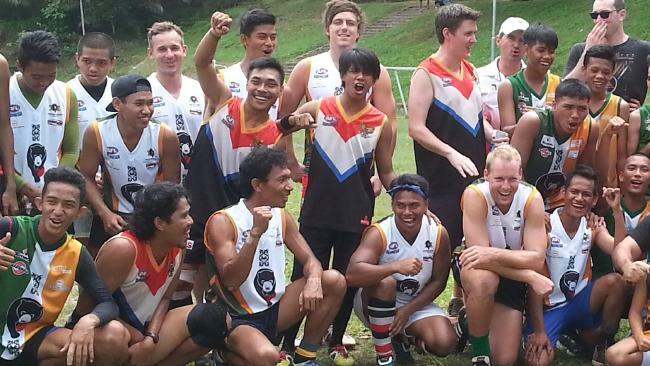 Tahs committeeman Garry Smart, senior coach Tim Weatherald and Premier League players Jake Smart and Lachlan Collihole were in East Borneo last month for the annual Borneo Bears v Jakarta Garudas clash at Balikpapan. The visit coincided with Anzac Day memorials in the region where one of the final and bloodiest battles of World War 2 were fought. But for Smart and Weatherald, who umpired the international game, Australian football was the main item on the agenda. “It all started with (four-time Hawthorn premiership player) Gary Buckenara’s visits to the country and this year was his seventh,’’ Smart said. “They love their Aussie Rules footy over there, it’s huge, even if it’s played on a soccer field instead of a full sized ground. Smart and Weatherald identified the two Borneonians as most likely to succeed at a higher level. “Timbal was vice-captain of Indonesia at last year’s International Cup in Melbourne and has plenty of ability and enthusiasm for the game,’’ Smart said. Waratahs want to get both players into Darwin to do a fortnight of pre-season work, including weights and sprint training, once funding and visas are sorted out. “We’ll get them back again for some trial games and later on for full-on premiership matches, all two-week stints,’’ Smart said.